The Olympic hurdler (and bobsledder) used training to recover from surgeries and is on her way to Olympic trials. When a doctor told Olympic hurdler and Rio 2016 games hopeful Lolo Jones that she needed hip surgery to repair a torn hip labrum last November, she stared at him and wondered if her career was over. How would she be able to go from crutches to competing in Olympic trials in July? “I had to take knowledge away from that,” said Jones. “I told myself, ‘Well, now now you have answers as to why you ran so badly all season, your hip was torn. So take that away, get your hip healthy, and improve from there. With every failure, there’s a learning lesson and if you can take something away then you can build upon and improve upon, you can use that as motivation,” she says. Jones is a veteran Olympian, having competed in the 2008 and 2012 Olympic games for track & field hurdles, and the 2014 winter Olympics as a bobsledder, where she finished in 11th place. Having placed fourth in the 100-meter hurdles in the 2012 Summer Olympics, Jones is hungry to make the 2016 Olympics this summer and finally get her medal. Here, Jones sat down for an interview with Muscle & Fitness Hers senior online editor, Diana Kelly, to talk training, diet, and overcoming setbacks. Lolo Jones: This year was a little different because I was coming off of surgery. It was my second surgery during a track season and I realized I needed to change up some things. Normally I’ll do fall training and that consists of running and weights. This year I had to get off crutches and start walking and then jogging again. With that it put me behind schedule with the group I train with because they’ve been doing workouts for two months and during those two months I was fighting to walk/run again. I needed to get in shape and get my heart really revved up so this year I incorporated Orangetheory workouts because they have the science behind their workouts with emphasis on the heart rate monitor. (Editor’s note: Jones is an Orangetheory ambassador.) I wanted to push myself as hard as I could without re-injuring myself. I used their workouts along with rehab exercises to get back in shape. When I returned to my workout group my coach was shocked but how in shape I was. I do Orangetheory three times a week. It’s a tough workout. [My trainers and I] have been focused on training geared towards my heart. That’s dependent on the heart rate monitor. With sports medicine, when I wake up I have to track my heart rate to see where I’m at. Do I need a recovery day? Can I push myself hard? That’s the main thing I’ve done differently, focusing on the science behind the workouts. I had a torn hip labrum (late 2015), and torn shoulder labrum (2014). I had surgery in November 2015 and I’m already running and hurdling. I started running shortly after surgery. When doctors first told me I needed surgery, my main concern was whether I had enough time to return fully healthy and in shape for my sport. By the end of December I was running. DK: You posted on your Facebook page saying that 2015 was your “worst year professionally,” tell us more about that. LJ: It was my second surgery within a season. In one season, I had two surgeries and two hamstring tears. I’m not going to sit here and lie and say I was super-positive during the whole thing. There were times that I cried my eyes out; there were times that I wondered if that was it, if I could try again. I felt physically able to come back but mentally I just felt drained. When you work so hard for something and it’s getting wiped away from you, it’s hard to pick yourself back up. I think the thing that gets you through it all is just attitude. How you end something is how you finish something. So if you end a relationship bitter, you’re going to start the next one bitter, if you end a race and are completely frustrated, your next race or competition you’re going to take those frustrations into that. The main thing is having an attitude adjustment after bad things happen. You just need to plug away and acknowledge you’re frustrated but don’t let those feelings determine your actions. There are a lot of times when I don’t want to work out, and I just push through that and feel great at the workout. Never let your feelings determine your outcome or where you’re going to go next. DK: What’s your favorite body part to train? LJ: I’m a runner and going to be partial, so I’m going to say legs. But I think a lot of people overlook that, a lot of focus is on arms, because everyone wants amazing arms in tank tops. But when I see someone with good legs…I know they’re a hard worker because legs are hard to get in shape. There are multiple things you have to do to get those nice contours so I appreciate when someone has really nice legs. I get a lot of the tone from running. I think the key is doing your strength training, with those heavy days but have light days to tone it up. It’s about those small attention to details. That’s why workouts with both are usually the complete package. Orangetheory Fitness incorporates the TRX suspension system which is amazing for me. A lot of people wondered how I recovered so quickly from hip surgery but when I’m doing TRX movements on my hands pulling the TRX movements with my hips, it’s really great for the hips, legs, and upper body. DK: What’s going on the next few months? LJ: The next few months are just training and then I move into indoor season. So I’ll start competing, doing indoor competitions and then transition to outdoor around April/May and then Olympic trials in July. DK: Would you like to go back to the winter Olympics? LJ: I definitely want to go back to the winter Olympics! I met some really cool teammates out there and I’m looking forward to returning to the blistering cold. DK: Tell us about the weight gain you had to do between track and field and competing in bobsled in the winter? LJ: They just changed the rules so I no longer have to gain the weight. In the past I had to gain 20 pounds. It had to be muscle because “fat doesn’t fly.” [Laughs] It was hard to do that in the long run but it helped my [strength training] because I had personal bests in all my weight exercises. I was on a time crunch [for the 2014 Olympics] so I actually didn’t [gain the weight] the healthiest way. I did a ton of protein shakes and doubling up on my portions on really healthy, clean stuff. Then it got to the point that I needed to gain that weight because the season was coming up. So then I just started going crazy eating ice cream and cheeseburgers, and it made me feel sick. It’s not the right thing to do because it took a while to shift into muscle. DK: Which athletes do you look up to? LJ: Gail Devers was a former American record holder in 100m hurdles. I broke it but she was always very competitive. She ran until she was 39 and was killing the game. She was very gracious. When I broke her record and another girl broke her record, she was one of the first people to reach out to us. It’s a great quality. 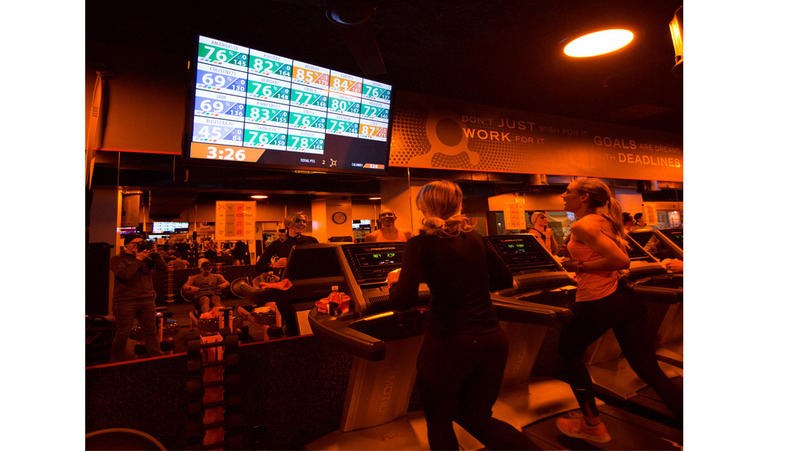 Editor’s note: The writer, Muscle & Fitness Hers’ Executive Editor, Alyssa Shaffer, and Deputy Editor, Cat Perry took an Orangetheory Fitness “power” class the week after this interview. We thought it was a tough, but fun workout that incorporated treadmill intervals, rowing intervals, and strength training. The 60-minute, five zone heart-rate monitored interval training concept is designed to maintain a target zone that stimulates metabolism and increases energy, and is supposed to fire up calorie burn for up to 36 hours post-workout.